Sydney’s Sun Herald weekend newspaper was promoted in early 2007 with a set of television commercials using slow motion cinematography to pick up the feeling of Sunday mornings, “Wake Up to Sun Herald”. 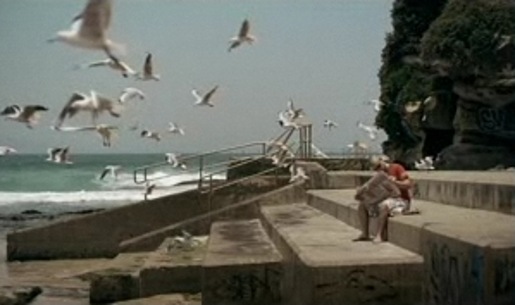 A man reads a newspaper on the beach as seagulls fly past him in slow motion. A man reads the morning newspaper as behind him we see a gymnast performing in slow motion on the family trampoline. A woman sits still as a skate boarder moves through the scene in slow motion. The Wake Up campaign was developed at Host, Sydney by Happy Soldiers/John Kane with agency producer Luisa Peters. Filming was shot by Jess Bluck via Revolver Film with director of photography Nigel Bluck, executive producer Michael Ritchie, producer Georgina Wilson and assistant producer Renee Hartl. Editor was Stewart Reeves at Guillotine. Music was provided by Groove Quantize.